College was some of the best years of my life. I was lucky enough to keep the same roommates for the three years I was there. They have become some of my dearest and closest friends. Every Sunday, we would take turns doing “Roommate Dinner”. There were 4 of us, and each of us was in charge of one week of the month. My roommate, Steph, was known for this dish. I never got the recipe from her before she left on her mission, so I kind of invented my own version. It is FANTASTIC! It is now a household favorite and I am constantly getting this request for dinner from my husband. If you are a mom, or a wife that needs to make a meal in a crunch, you know casseroles are one of the easiest dishes to make! An easy, fast and delicious dinner! Cook broccoli in salted water according to bag directions. 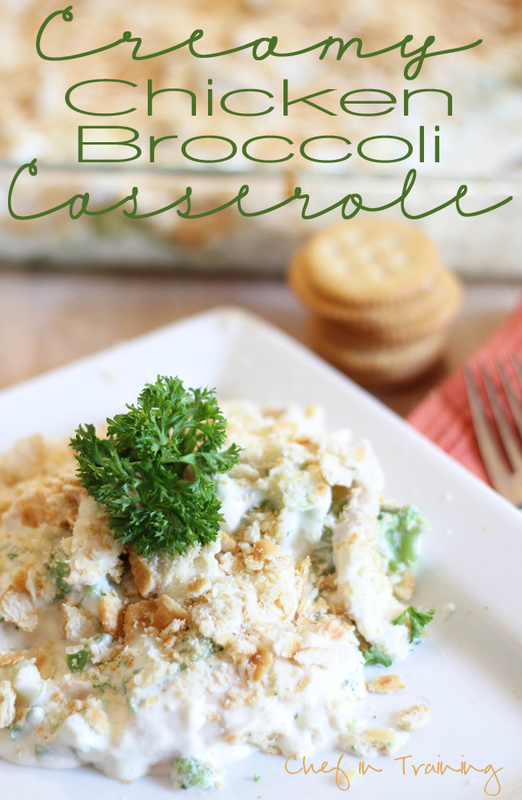 Place the broccoli in a greased 9x13 casserole dish. Heat the milk, cream cheese, garlic salt and ½ cup Parmesan cheese over low heat, stirring until the mixture is smooth. Pour 1 cup of sauce over the broccoli. Next add the chicken into the pan and pour rest of sauce over it. Sprinkle the top with ¼ cup Parmesan cheese and Ritz cracker crumbs. Bake at 350 degrees F for 15-20 minutes. I made this for my family tonight and they all loved it! Everyone went back for more. I started from scratch, simmering my own chicken and chopping fresh broccoli, but even with that, it was a nice easy recipe, not stressful at all. The sauce is so rich, delicious, creamy and smooth, that I can see other applications for it in other dishes too. I have to eat low carb and this fit right in with my dietary requirements. This along with a nice big green salad made such a nice and comforting dinner. Thank you for sharing this delicious recipe with us. Can I use fresh broccoli for this? i make this except i only use one block of cream cheese and then a container of the cream cheese cooking cream and a little half and half. soooooo yummy! we eat ours over pasta!!! That sounds really good - and easy - and my family likes all those ingredients! Will for sure be trying this soon. I've made a few of your recipes, and everything always turns out to be yummy. Thanks for sharing! Made this tonight and it was awesome! Used one container of the italian herb cooking creme in place of one block of cream cheese and put it over egg noodles. Yum! Thank you! Tonight I made this delicious recipe!Wow was it great, I did not have Ritz so I used Panko instead.This is definately being added to my rotating list! Thank you for this great recipe. I made this tonight for Sunday dinner with my roommates at BYU! It was sooo yummy! Thanks for the recipe! I made this last night for supper.... yummy! I used the canned chicken to save on time. Thanks for another great recipe!!! THANK YOU!!!!! I was just thinking I had to run to the store to buy one more block of cream cheese for this recipe, but then I saw your comment about the cream of mushroom soup. How perfect!!! I will use the 1 block I have, and then a can of creamy soup. Genius!!! My brain doesn't always think of substitutes, so I'm very grateful yours does! :-) You just saved me a trip to the store! Tonight, I've cooked a very little bit of pasta & put the leftovers on top & put it back in the oven. Can't wait for it to come out! I think it might even be better the second time around. Thank you SO much for this recipe!! I was wondering if I could turn this into a crockpot meal. Would the chicken cook in the cream cheese mixture? I love the recipe over pasta! Made this last night! Everyone loved it! I used one cream cheese block and italian cooking cream. We ate it over egg noodles. This will go into our rotation. Thanks for the recipe! This was super yummy. I made it last night and it made my house smell delicious. Everyone loved it. So easy and really cheap to grab the ingredients ( about 18 dollars ). I used a rotisserie chicken and it turned out perfect. Thanks for sharing ! A half recipe fit in an 11x7 pan. Made with raw broccoli (in an ungreased baking dish) and the broccoli was still on the overdone side. Not sure what the huge fuss about this is; we didn't think it was particularly great. Sorry. Nikki, do I use grated or shredded parmesan cheese for this recipe? Didn't know if I should use the powder parm cheese in the container or the other kind...or does it matter? Can this be made in the morning and placed in the fridge until dinner time? We're making this tonight! I love this website - quick and easy meals for families on the go!! Side note: if you need shredded chicken in a pinch - use your Kitchen Aid mixer. Poach chicken breasts for ten minutes. Then cover and let sit for ten minutes off the burner. Use the paddle attachment on your mixer. Toss chicken in and mix on low until you've reached your desired shreddedness! Careful though - my husband walked away while it was mixing and we ended up with pulverized chicken which didn't turn out well. LOL. It only takes a few minutes, less than 2! I have not made this recipe yet but by all the good comments Im going to ! What I need to know is,how many does it serve ? Im thinking of making this for Christmas eve for the whole family,there will be about 12 here.Im thinking I need to make two but thought I would ask first.Thank you. This was really easy to make and my wife and kids all loved this dinner. Thank you soo much. I made this and thought it was so easy!! As I made the initial sauce, I thought, 'hmmm this is basically Alfredo sauce... which means this recipe is gonna be amazing!!!' And it was!!! I made it in 2 batches: a small batch for supper Friday night for the Sabbath, and then a bigger pan to bring to our weekly potluck fellowship. BIG HIT!!! My hubby approved so much he kept asking if we could just bring something else to the potluck so we could keep the whole casserole for ourselves. Heeheehee We loved it!!! I'm pulling up the recipe to make it again and shooting myself in the foot for not picking up another block of cream cheese when I was out. This recipe is definitely worth a quick trip to the store! !